Google Adds Another Layer of Security to Android: Keeping you safe. Google has always maintained that Android is safe, even if many users - and researchers - don't agree with it. So at I/O in Mountain View, the company moved to ease security fears over the Android and launched a new service called Play Protect. 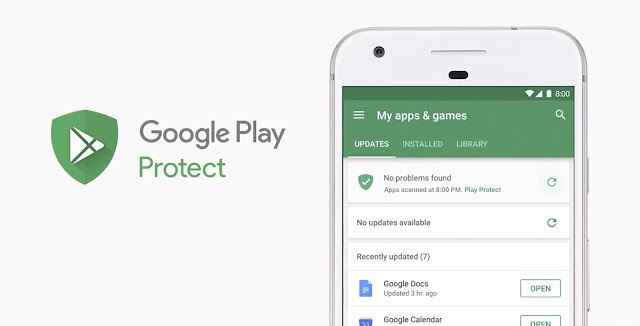 Part of the Google Play, the Protect will overtly scan apps on a phone and let users find out if there are rogue and dangerous apps running in the background on their phones. Google Play Store already had a feature called 'Verify apps' which would analyze an app before it's installed onto your device for potential threats. The Protect will be inbuilt inside the Play, the app through which Android users download apps. According to the Help description of the service, Play Protect “periodically scans your device” and will alert users if an app has been removed because it was labeled dangerous. “You can locate your device by signing into your Google account or even call it directly from your browser. Lock your phone remotely or display a message on the lock screen, so if someone finds it they know who to contact. If you’re convinced it’s lost for good you can erase all your data,” according to Google. Find My Device can be downloaded starting this week. Google claims there are more than two billion active Android devices and that Play Protect will scan and verify up to 50 billion of apps per day.